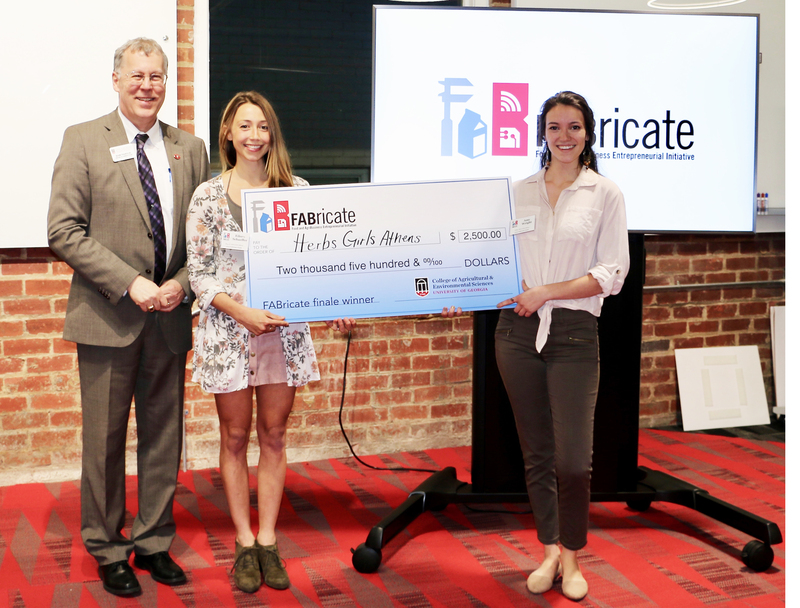 CAES Dean and Director Sam Pardue congratulates CAES agribusiness master’s degree student Eileen Schaffer and psychology student Amy Wright, otherwise known as Herb Girls Athens, for their win at the 2019 FABricate entrepreneurship competition. In the final pitch contest held on March 27 at UGA’s Studio 225, Student Center for Entrepreneurship, CAES agribusiness master’s degree student Eileen Schaffer and psychology student Amy Wright wowed the judges with their antioxidant, anti-inflammatory coffee supplement. The powder, Rally Coffee, is designed to be mixed into brewed coffee to give extra health benefits and is spiked with cinnamon, cardamom and chicory for added flavor. Since 2017, students from CAES have presented their best ideas for world-changing technologies, innovative business plans and market-disrupting food products during the college’s annual FABricate entrepreneurship challenge. This year’s competitors were given the option of taking a new business development seminar class as they worked to refine their product concepts and business plans. Vanessa Shonkwiler, an applied economist and business development specialist who works with the CAES Center for Agribusiness and Economic Development, guided students through the process of bringing their ideas to fruition. Cash prizes were awarded to the Herb Girls and to second place winner Beer-BQ Sauce for their line of Athens-made beer-infused barbecue sauces, Classic City Sauces. The Beer-BQ team was made up of two agribusiness undergraduate students, Blake Carter and Tristan Smith, and mechanical engineering undergraduate Coleman Purcell. Sydney Mai, an environmental chemistry undergraduate, and Xiao Tan, a landscape architecture undergraduate, developed Flower-ly Lips, Fairy’s Secret, a plant-based cosmetics line meant to be safe for children. Davis Verner, a turfgrass management undergraduate, and McCoy Savage and Luke Kosko, both agribusiness master’s degree students, developed Agrow-Fert, a process to mine phosphorus from poultry litter to be used in fertilizer. Annakay Abrahams, a doctoral student studying plant pathology, developed SporAvert, a water-permeable membrane that could be used to cover high-value crops to prevent the spread of fungal diseases. This year’s judges were Keith Kelly, owner of Farmview Market in Madison, Georgia, Caroline Hofland, CEO of CBH International, and Jim Flannery of Four Athens and the UGA Idea Accelerator. Keith and Pam Kelly, Caroline Hofland, the UGA Entrepreneurship Program and the CAES Office of Academic Affairs sponsored the contest.